Gujarat, the westernmost state of India, shares its part into the Arabian Sea. Sharing its international border with Pakistan in the northwest, the state has common borders with several states of Rajasthan, Madhya Pradesh and Maharashtra, and also with the Union Territories of Diu, Daman and Dadra and Nagar Haveli. The geographical map of the state can be divided into three regions. The eastern region includes major cities like Ahmedabad, Surat and Vadodra. The Saurashtra region spreads over the Gulf of Cambay and the Gulf of Kutch. The northern region of Kutch is a salty desert. Gujarat is well-known for its old splendid palaces, grand temples, rare animals and birds in lush green woodland along with its vivacious and vivid fairs, festivals and culture. Gujarat has more domestic airports than most states of India put together, at Ahmedabad, Surat, Bhavnagar, Junagarh, Vadodara, Keshod, Kandla, Rajkot and Bhuj operating flights to New Delhi, Mumbai, Chennai and Kolkata, and other parts of India. The state has a vast rail network including linking Ahmedabad to Delhi and Mumbai. Its road network connects it to the neighboring states of Rajasthan, Maharashtra and Madhya Pradesh. Winter season stays here from October to February, making it the best time to visit Gujarat when the weather is amusing. summers are scorching hot, remaining from March to May. Monsoon wets the state from June to September. 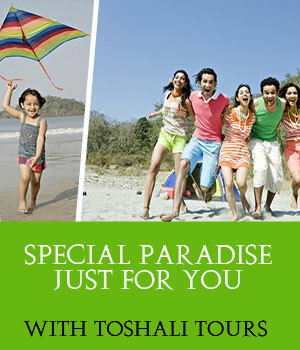 Winter season from November to March is the best time to visit Goa, making it the peak tourist season of the region. Ahmedabad : Known for Sabarmati Ashram, Jama Masjid and Hathee Singh Temple, among others. Bhavnagar : Known for Takhteshwar Temple, Gandhi Smriti Museum and Clock Tower & Gaurishankar Lake, and Palitana, 56 km form here. Bhuj : Known for well ornamented Hindu temples, gorgeous palaces and intricately carved wooden pavilions. Champaner : Known for the old fort on 822 meter height of Pavagadh peak, a holy place of pilgrimage. The major attractions of the fort are its amazing rocky defenses and the Makai kota where the rulers kept their grain. Other attractions here are the ruins of Patai Rawal palace, Naulakha Kotha Mansion, the 11th century Laukalish Temple and a number of religious monuments. Chhota Udepur : Known for the ruins overgrown with shrubs and creepers and the Darbar Hall burnt down few years back. Other attractions here are several buildings built in early 1920's. Porbandar : Known for being the birthplace of the Father of the Nation Mahatma Gandhi, this seaport possesses many amusing beaches with beach villas. Gujarat possesses a wide range of flora and fauna, with as many as 500 varieties of mammals, over 2,000 species of birds, a wide variety of insects, fishes, amphibians, reptiles, etc. Possessing a wide range of vegetation, the state has over 400 species of plants such as Teak, Boswellia Serrata, Anogeissus Latifolia and Diospyros, etc.